NYPD's latest Twitter fail: "You can't handle the truth!" 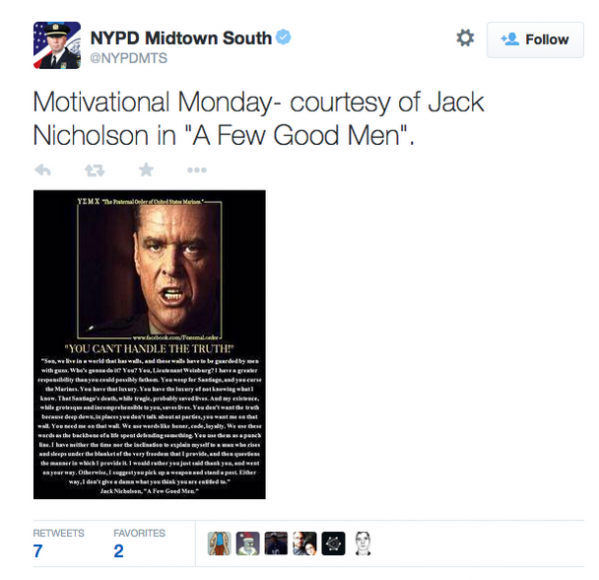 On Monday afternoon, the New York Police Department Midtown South precinct tweeted a meme of Jack Nicholson's speech in the film "A Few Good Men." "You can't handle the truth!" the monologue reads. "I have neither the time nor the inclination to explain myself to a man who rises and sleeps under the blanket of the very freedom that I provide, and then questions the manner in which I provide it! I would rather you just said 'thank you,' and went on your way. Otherwise, I suggest you pick up a weapon and stand a post." First of all, even if you have absolutely no knowledge of the film, the above speech certainly does not seem like it comes from a man sympathetic to civilians. But if you do know the film, it's even worse. Nicholson plays Colonel Nathan Jessup, a man who has justified a clandestine "Code Red" attack on an American Marine. This attack is considered murder and Jessup is arrested immediately after giving the speech. The NYPD has been in the national spotlight after a grand jury decided not to indict Officer Daniel Pantaleo after he performed an illegal chokehold on unarmed civilian Eric Garner, leading to Garner's death. The tweet has been deleted from the precinct's account. A Few Good Men Eric Garner New York Police Department Video You Can't Handle The Truth!